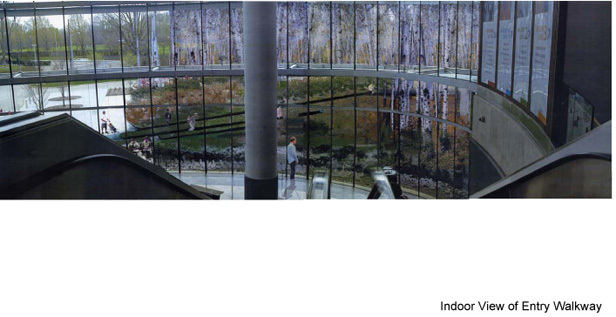 At the entrance of the Indianapolis Museum of Art, the visitor encounters a fragment of landscape lifted off the pavement. Three long cuts are visible in the planted area just beyond this. Each of these slots can be entered and has a steel mesh walking surface where water can be glimpsed and heard below. The adjacent edges of grass are also peeled off the ground surface. The widest of the cuts becomes the main walkway and leads the viewer below the surface of the ground into a short tunnel. This is the beginning of a 1200 foot walkway that will move up through the tree canopy, across a canal, over a wetland and into the Art and Nature Park. It is also the start of an introduction to the grounds beyond the walls of the Museum. Here the visitor will be put in unexpected situations, be able to examine this site in detail and come to understand its history. With this and other projects to be produced by artists in the coming years it will be a place of experimentation where the interest and curiosity of the visitor is aroused through experiential and interpretive encounters. One of the most important issues to be explored will be how new bonds between the built environment and the natural world can be created. With the support of the Museum artists will have a central role in exploring these issues of our times. Emerging from the tunnel, the visitor is suspended on a platform at the top of a ravine. It is possible to have the feeling of ‘walking the plank’ into thin air on one of the five finger-like walkways projecting out into the tree canopy. Elevated fragments of landscape continue at this same level beyond the ends of the walkways. These fragments continue to appear along the entire walkway as points that appear to be possible to occupy. The water which has been running under the surface of the walkway flows into a large basin in the center of the platform. From this point on the visitor follows the flow of water from this bluff to the low lying land of the Art & Nature Park and becomes aware of how the surrounding landscape has been shaped by its movement. A description of this process will be available at audio stopping places along the walkway as well as other information about the flora and fauna encountered along the walkway. 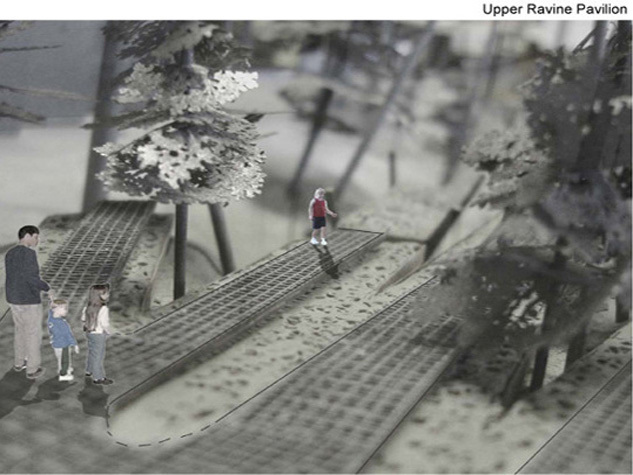 One of the five pathways continues out into the ravine as an elevated walkway. It is made up of a double layer of expanded metal mesh on a steel frame held up at regular intervals by Y shaped supports. 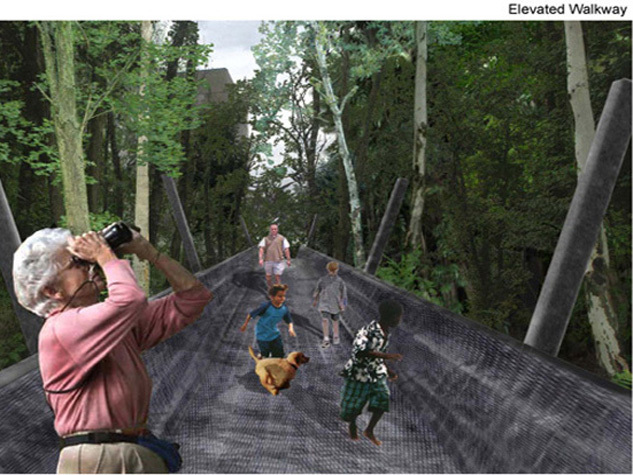 The effect is one of being suspended in a long moiré patterned basket as the path moves through the tree canopy. 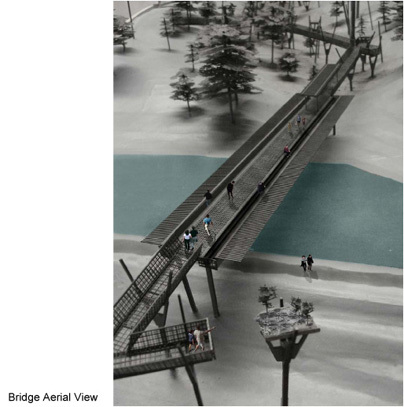 The walkway varies in height above the ground from four feet to forty feet. Under the surface of the walk a gutter like trough carries water from the top of the ravine. It can be heard flowing into catch basins at regular intervals. 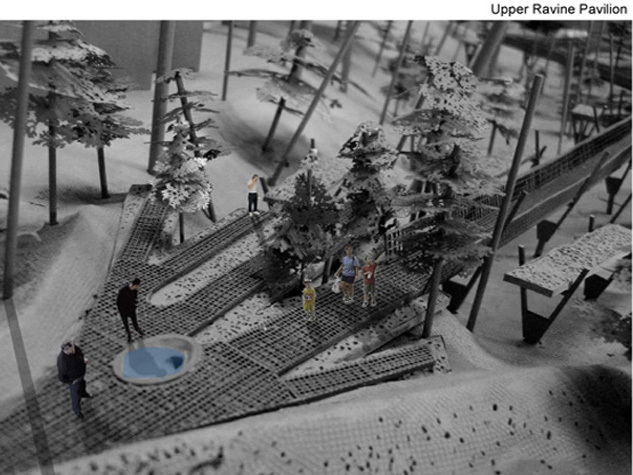 There are look-outs and seating areas at each point where the walk changes directions. One branch leads to the outdoor theater behind the museum. As the walkway approaches the canal the visitor passes under a section of trellis which leads onto the bridge. This broad open span is twenty nine feet wide and one hundred forty-four feet long. 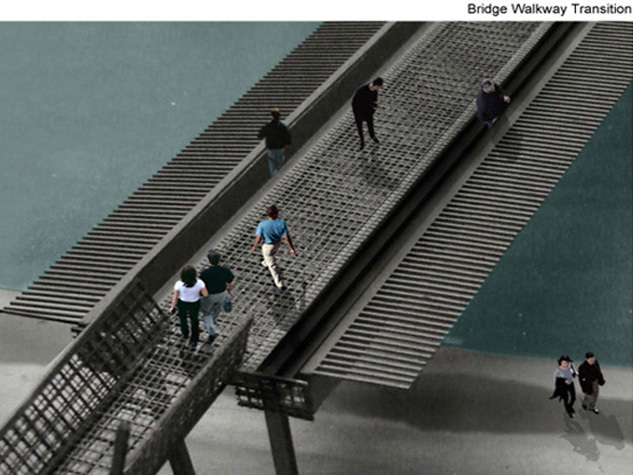 The walking surface is made up of the same steel mesh as the walkway and allows glimpses through to the water below. On either side of the central walking surface steps lead down to a trough, the wall of which acts as the railing for the bridge. This becomes a seating area where visitors can have an unobstructed view of the canal and nature preserve. A span of regularly spaced steel members visually extends the surface of the bridge to either side. Standing at the center of this bridge which appears to have no railings the visitor is given a broad, unobstructed view of the wetland ahead. From the bridge the walkway enters the wooded area of the nature preserve. At an elevation of forty feet above ground there is a view down the length of the designated wetland. Further along this section of the walk a zigzagging path allows access to the bike path at the edge of the canal. Moving first in one direction and then another a visitor can take in multiple views of the surroundings. 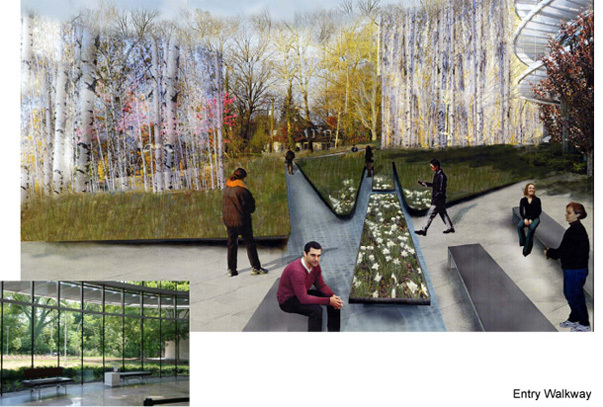 The walkway continues on until it merges with the upper level of the Art & Nature pavilion. From this landing a view of the reflecting pool on the roof is juxtaposed with the lake giving focus to the destination of the water from the bluff above. The path continues to ramp down tunneling through the planted surface of this pavilion turning sharply once again. Here it moves along the outside edge of the structure until it reaches the entry court. 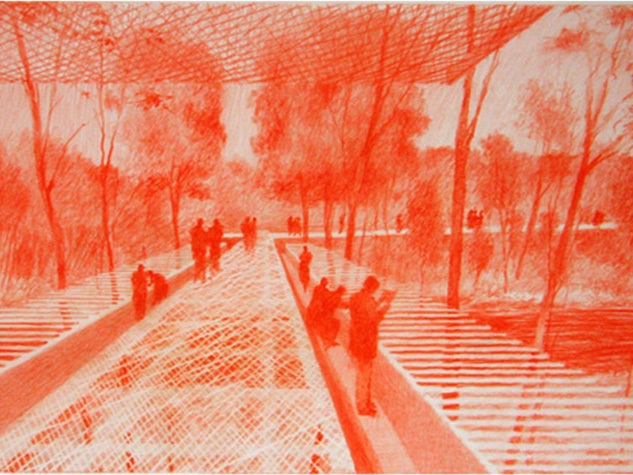 The adjacent landscape is viewed through a veil of water that comes off the outer edge of the pavilion. This is the water that has been carried along the underside of the elevated walkway. After proceeding through the interior space of the pavilion the viewer finds a series of benches that echo the splayed configuration of the paths at the top of the ravine. They hover over a steel grate floor that allows water to be seen and heard below. From this position the view of the lake beyond is framed by the open end of the building. A last fragment of elevated landscape is found in the water near the shore. The merging of the path and pavilion is the culmination of the journey visitors have taken to reach the Virginia B. Fairbanks Art & Nature Park. 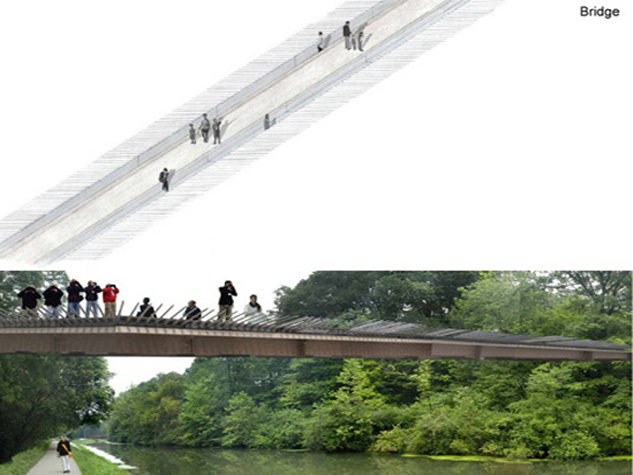 They have moved from the inside of the museum to a path which takes them below ground level, out through the canopy of the trees onto a suspended platform crossing the canal and finally into this embedded structure with a framed view of the water. The experience of occupying (and wishing to occupy) the landscape from these multiple and unexpected positions allows the visitor to acquire a new understanding of this place and how it was formed.